Two stories which seem to be constantly recurring on our TV screens and in the papers are the two E’s of the Economy and the Environment. No matter how much we try to ignore them, both, in one way or another have a direct impact on our lives. With so many money saving schemes and recycling campaigns out there, it can be difficult to keep track of what to do and wonder if what you are doing is making a difference. One way in which you can make a difference to both is by switching the type of batteries you use from disposable (Alkaline) to rechargeable (Nickel Metal Hydride – NiMH). It would be easy to say that the benefits are obvious; Alkaline batteries have single usage whereas NiMH batteries can be recharged up to 1000 times so it is obvious that you get more use from rechargeable batteries and produce less waste at the same time. Unfortunately, it isn’t that simple as with all alternative technologies there are advantages and disadvantages. In this post, I am mostly talking about standard size batteries, AAA, AA, generally the most commonly used in the home for remote controls, game console controllers, portable speakers, digital cameras, small electronic toys etc. We can also include C and D cells used in lights, torches and larger electronic toys. A lot of these devices have the characteristic of irregular use; e.g. a remote control sits on the arm of a chair for a long time and is then picked up to be used, a remote control car (no matter how much was wanted at Christmas and promised to be played all the time) can spend considerable periods of time in the cupboard only to be used on rare occasions. This type of usage is the major reason why Alkaline batteries are the most commonly used batteries in the UK household. Alkaline batteries have low self-discharge, this means that the battery doesn’t lose much of the energy stored in the battery when it’s not being used. 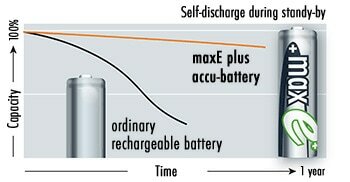 It is estimated that Alkaline batteries have a self discharge rate of around 2% per year, for NiMH batteries this is more like 1% per day when not in use meaning that you would need to know how charged the battery is and make sure it is charged regularly. This wouldn’t be too difficult to achieve but we all know how hectic our lives are and this kind of usage isn’t practical so the cost savings are outweighed by the convenience. So next time you think of picking up a cheap packet of disposable AA batteries have a little think to yourself, it may be cheap at the till now but over time you’ll hurt both your pocket and the environment.